It has been four years since I saw U2’s final show on the 360 Tour in Moncton, New Brunswick, Canada. Ever since they dropped their new album, Songs of Innocence, on iTunes last October, and buzz of them touring began to overtake the fan community, I was determined that I would see them on the very first show of their tour. Where ever it was. I guess I was fairly certain they would start in North America. Thankfully because I don’t think I could have swung a trip to Europe or any other international location at this time. I have had a financially draining last four years with a wedding and home purchase. I really wanted to be at the first show on the tour because I would be the first to see what was to come. I would have no idea what they were going to play (other than the obvious, songs from their new album). The whole mystery around what was going to happen excited me. Social media and the internet has spoiled concert-going in a way. 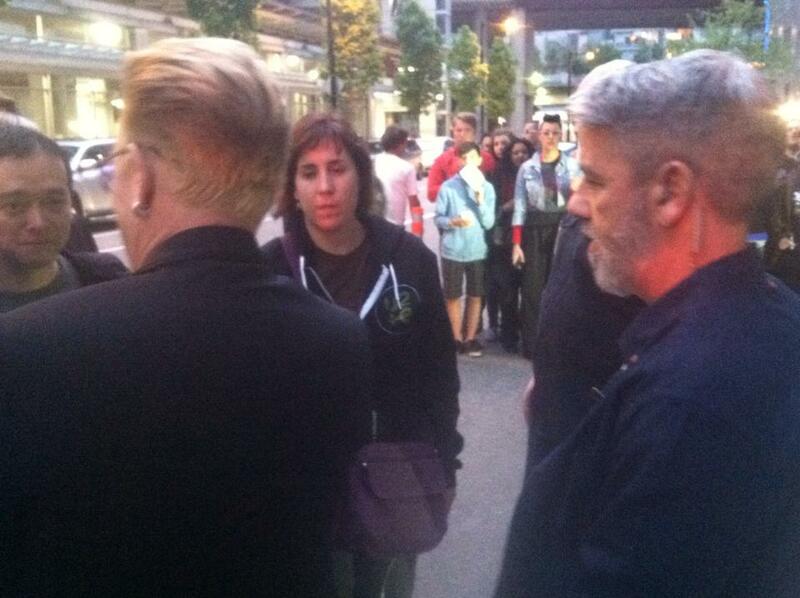 With the organized fan community that U2 has, you can virtually be present at any show around the world. 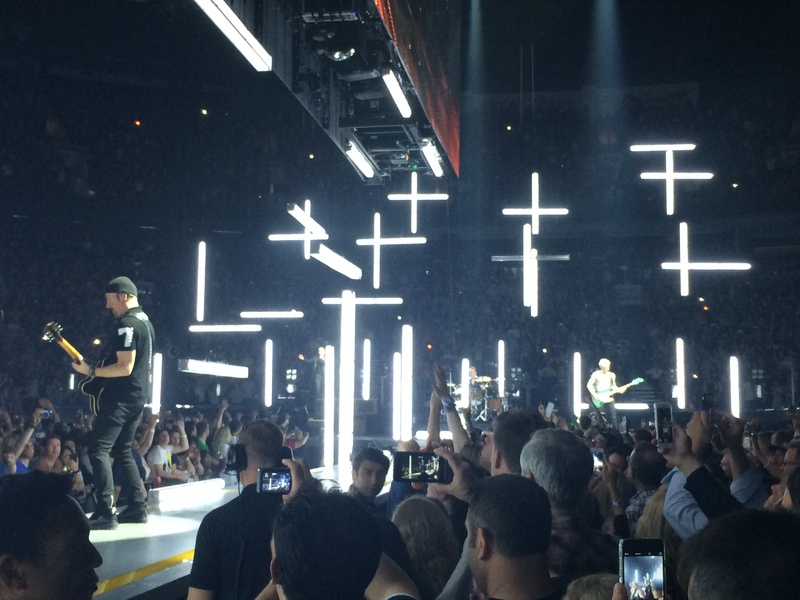 On the last U2 tour, people at shows tweeted setlists real-time. Now with such apps as Meerkat and Periscope, fans can live stream shows. Friends of mine going to shows later in the tour have to put themselves on a media blackout to not find out too much information about the show if they prefer the element of surprise. It’s very hard to avoid all those concert details. And because of this, I kind of miss the pre-internet days. Yet, at the same time, I love the accessibility of music and art that the internet provides. There are U2 sites that contain a huge archive of U2 bootlegs, collected from shows going back to the early 1980s. Before I even left Vancouver, bootlegs from both nights were already available. At the time of this writing, there are bootlegs for all four of the U2 shows that have taken place thus far in the infancy of this tour. In this day and age, I can leave a U2 concert with 80% confidence that I will be able to forever listen to the show via some recording. This is priceless. Still. I have no willpower. So I knew that if my only shows were later in the tour, despite all of my attempts to avoid peeking at the videos, setlists, and bootlegs out there, I would fail miserably. So I freed myself from recoiling at the information overload by getting tickets to the very first show on the tour. Problem solved. I didn’t get to hear many of the rehearsed songs while I was in Vancouver because the outside of Rogers arena is probably the noisiest place I’ve ever been. There is a constant ambient noise of traffic at all hours of the day and night. So even though I spent hours waiting to meet the band while they rehearsed, I only vaguely heard music a few times. I did, however, listen to one recording on youtube of them playing “Raised By Wolves” that someone recorded outside of Pacific Coliseum where they practiced weeks before the concert and from that clip I decided that despite bicycle accident injuries and painkillers, Bono was definitely ready to perform. We decided to line up at 1pm on the day of the first show. It turned out to be a good choice because even at that point there were no more than 150 people or so (possibly less). Okay, for most more casual fans, lining up 5 hours before the doors open is probably still extreme (I believe my husband’s exact quote was, “Have fun with that.”). But it’s actually not that bad. Time flies by because you are amongst others who also love the band as much as you do and you can share your excitement and anticipation of the show. There was some worry about the ticketing process for GA because it was for the first time ever paperless. You had to scan the credit card you used to pay for the show. I was in a panic because for one of the shows I bought tickets to (Chicago 3), I had used another credit card. So I brought both credit cards to each show, even though I had double and triple checked which credit card I used for which show before I even left Ohio. Anyway, it turned out to be a pretty painless process: They scanned your card, the machine spits out a receipt (yay, souvenir! ), and then you walk with the receipt to a table where they then put a wristband on you that matches the side of the arena from which you’re supposed to enter. 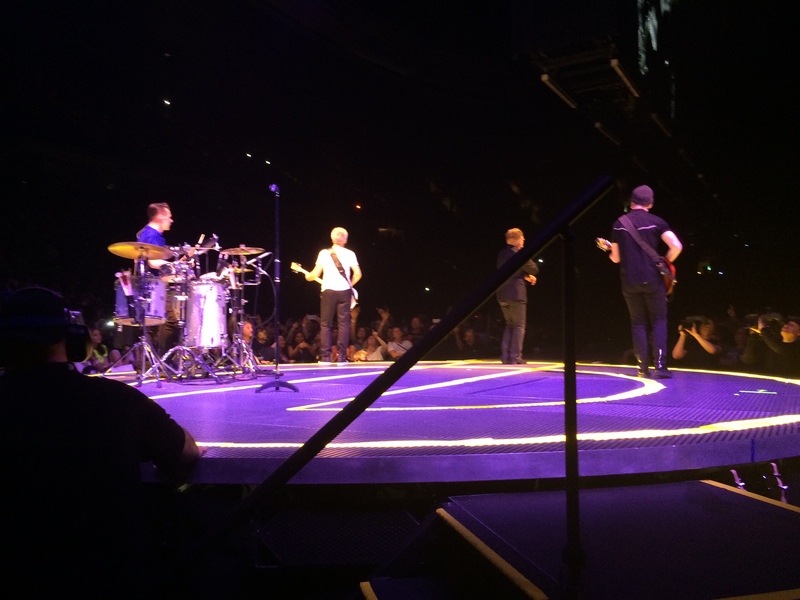 For this tour, U2’s stage goes across the whole floor, dividing the arena floor into a North and South side. Because this show is primarily about the band’s early days, the arena floor is divided in this way to represent the north and south sides of Dublin (the band grew up on the north side). A catwalk runs down the middle of the floor with a main stage at one end and a smaller b-stage in the shape of an “e” (for experience) at the other. Both nights, we ended up on the North side. Other fans said they were able to move between sides during the shows but I don’t know how that happened as the second night we were at the back of the b-stage and security kept the access closed off throughout the show. Yeah, it was only roped off. My guess is that some people snuck through. On the first night, there was a lot of confusion. The people who had been the front of the line had mostly already filled up the entire length of rail space (which is quite vast) on the north side. We originally had some rail on the b-stage, but then we jumped up to the main stage to see what it was like up there, thought about staying, and then decided to leave to go back to the b-stage. We ran into some friends midway along the catwalk rail and decided to stay there. We were second row from the rail, our friends who had also arrived at 1pm with us had the rail. It was really a toss-up because we had no idea what the show was going to be like to even know where a “good” spot was. So we just decided to hold our position and see what happened. It took the arena a long time to fill after that. Probably because most people arrive closer to the time the show is supposed to start (7:30) and aren’t freaks like us who want to vie for a close spot to the band. Panorama of the crowd at Rogers Arena. Like U2 had expressed, I was a little nervous to hear how the songs from the new album would be received. But my fears immediately vanished as soon as the opening “oh oh”‘s from “The Miracle (Of Joey Ramone)” began and I heard the arena fill with the sound of thousands of fans singing along (myself included). The band started from the main stage. I was a little disappointed, though, that from my position the rail, I really could not see much of the action on the main stage. The first four songs were sung from there and Bono started to walk out to the catwalk some during “Iris” (5 songs in). I tried to not let it bother me/disappoint me that I couldn’t see. I knew that I was by a rail and eventually the band would start walking down our way. The band started out strong with some incredible songs old and new–“Out of Control” (a favorite of mine), “Vertigo,” and “I Will Follow.” Incidentally, the slot “Out of Control” filled now seems, after 6 shows, to a position for an array of songs from the band’s first two albums. Though nothing has yet been played from October, U2’s second album, I hold out hope that “Gloria” might get slipped in there at some point (hopefully when I’m at the show). Since then, the band has played “Electric Co” in this spot. 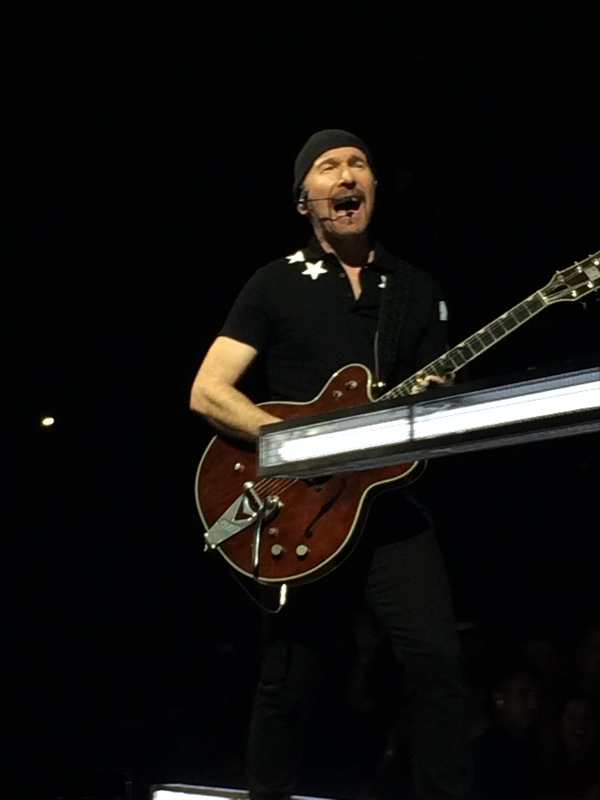 The Edge on the catwalk in front of us during the encore. After “Iris,” a large metal screen with a walkway between each side descended to just above the catwalk. Bono invited the audience to visit Cedarwood Road with him and then he climbs up a ladder into the screen and the band plays the song “Cedarwood Road.” From my point of view just beneath the catwalk, I could only see Bono’s feet as he walked along the pathway in the screen. However, between videos I caught later, and the second night, everyone in the audience besides the rail rats see a cartoon representation of houses and rooms as Bono walks along them. It’s actually pretty cool and I’m sure if you’re up in nosebleeds it gives you a sense of closeness to the band as though you were on the floor. 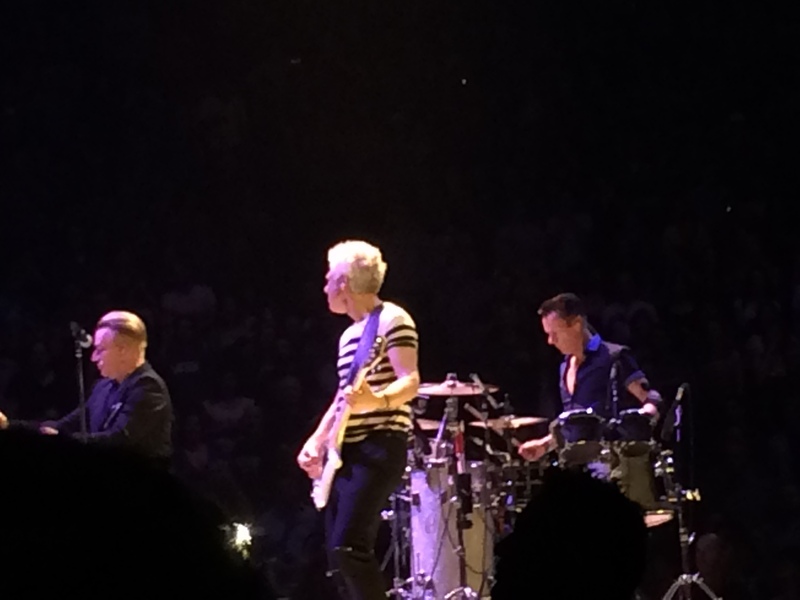 I thought that I wouldn’t mind if U2 stopped playing “Sunday Bloody Sunday” for a tour… Until Larry Mullen Jr. came out to the catwalk and began pounding a vicious military-style beat on a snare drum that he carried. This reworked acoustic version of “Sunday Bloody Sunday” made the song fresh again for my ears. It was beautiful and eerie and set to a part of the show that playacted a car bombing that happened during Bono’s youth. From our position on the catwalk, we were right next to Larry and the drum beats were loud and jarring and completely impressive in how they set the mood as the video of a newscaster talking of the car bombing played. A final hit of the drum at the end before the fade into “Raised By Wolves” was just amazing. 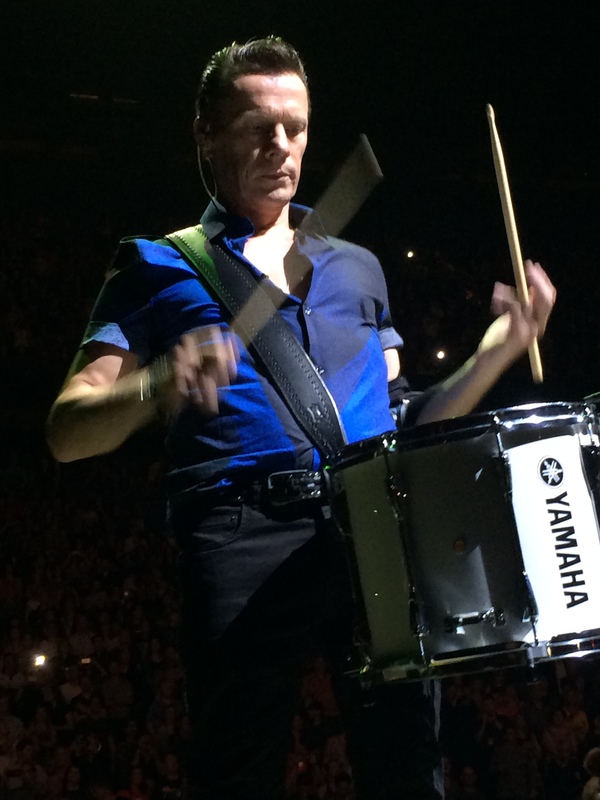 Larry Mullen Jr is a machine. The second half of the show was largely on the b-stage, to which I had a great view. 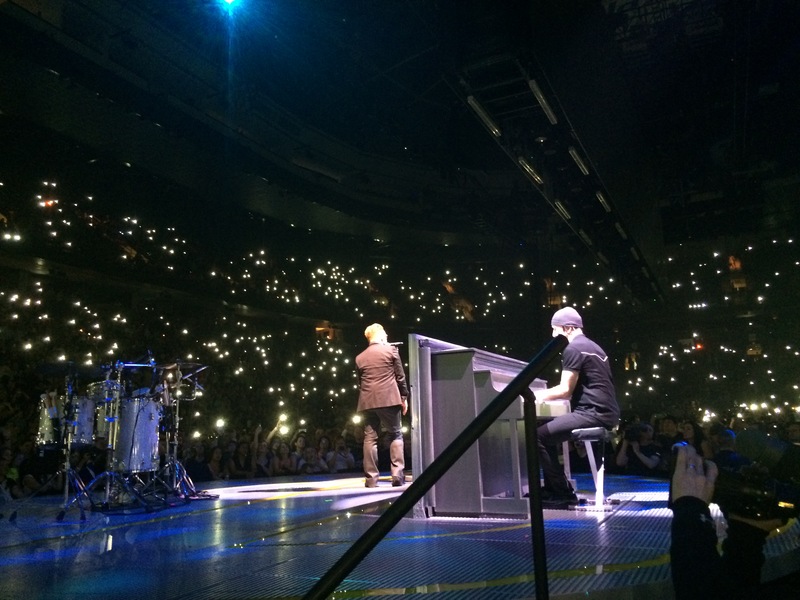 U2 played some songs I’ve never had the pleasure of hearing live–“Sweetest Thing” and “Desire”–and then played an acoustic version of “Every Breaking Wave.” Without prompting, the audience began to shine their cell phone lights and the arena became a beautiful twinkling sea of stars. Bono, Adam, and Larry play at the b-stage. The main set ended with “The Troubles” (which at the time of this writing is the only song this new song has been played) and “With or Without You.” The encore was a rousing four-punch hit of “City of Blinding Lights,” “Beautiful Day,” “Where The Streets Have No Name,” and “I Still Haven’t Found What I’m Looking For.” I find “Still Haven’t Found” kind of a weird song to end on, but they have been doing it the first night in every city on this tour so far, it seems. I did do a lot of jumping around throughout the show and all those bodies together made me very sweaty and parched by the end. It was great, though, and my first reaction was that I needed some time to process what had happened. Sweaty Mars Girl after night 1. For the second show, we ended up at the back of the b-stage which gave us a great view up the entire catwalk to the main stage. I could see all the action a lot better, including a sideways view of the video screen to catch some of the things I’d missed the first night. 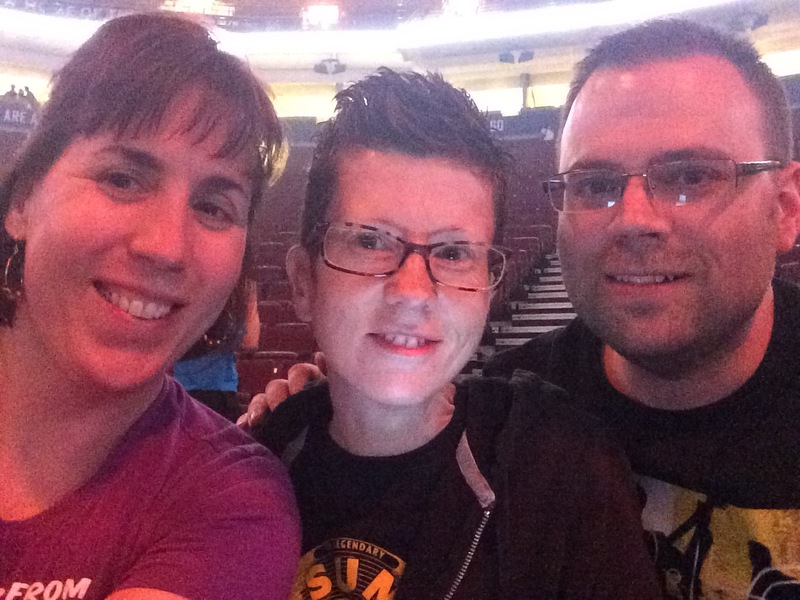 Mars Girl, Kristy, and Shawn on night 2 of U2 in Vancouver. Our view from the b-stage. 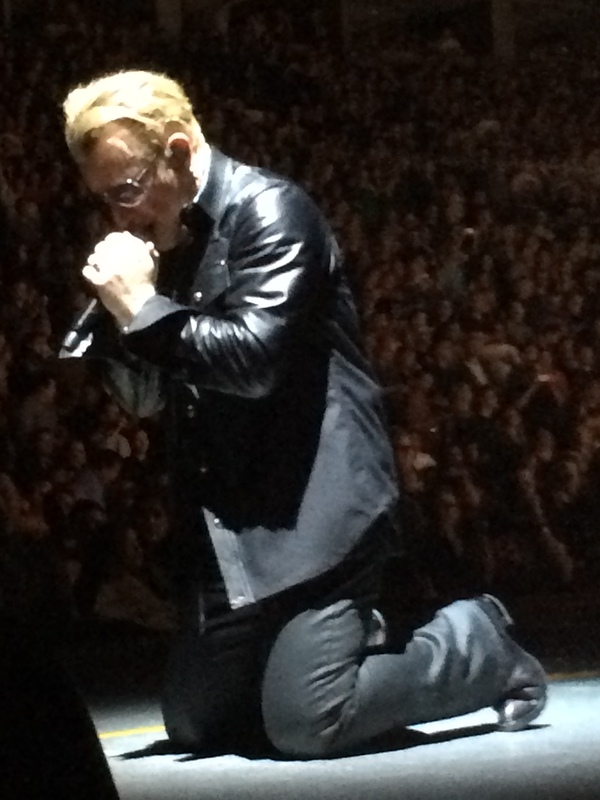 Bono in an emotional ending to “Raised By Wolves” in which he utters Psalm 23. On the b-stage, they performed “When Love Comes To Town” as a tribute to B. B. King who had passed away the previous night. And in the vein of Rattle And Hum favorites, “Angel of Harlem” made an appearance as well. The encore blew me away with first “Miracle Drug”–my favorite song from How To Dismantle an Atomic Bomb–followed by “Bad.” They ended the encore with “One,” which seemed a bit more fitting a song to end the show on. I thought I was blown away the first night, but second night was even better. I left Rogers with the realization that I heard all but three songs from the new album (no “Volcano,” my favorite, waaaaah!). The new songs really shine on this tour and I have to say that they have already blown the album version so far out of the water that now I pretty much just want to listen to the live versions provided by the bootlegs. Knowing the second night what would happen at the show was really not a problem. Even the narrative parts that are apparently in the show for good (or at least for a long run) invoked an emotional response for me. I’m trying now not to listen to the bootlegs so much in fear that when I see them in Chicago in June that my ears might be a little too used to the sound. I’m failing miserably… There is also an off-chance that I might also go to Toronto… Uh… If I can swing it. 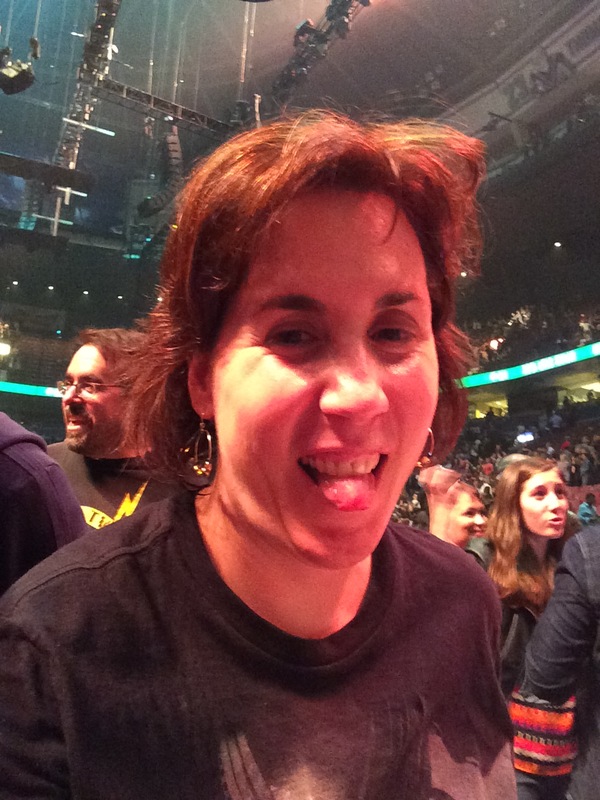 I try to remind myself that U2 is supposed to take the show outside to stadiums in 2016 and that I can continue to see them then… But this addiction is just so overwhelming. I just want to stand there in the audience, witnessing this greatness that is U2, and never come down from the high of that moment. These concerts remind me of why I’m such a huge fan: This band is unique, one-of-the-kind, and they give everything into their performances. You leave feeling as though you embarked on a journey with them… And you totally have. 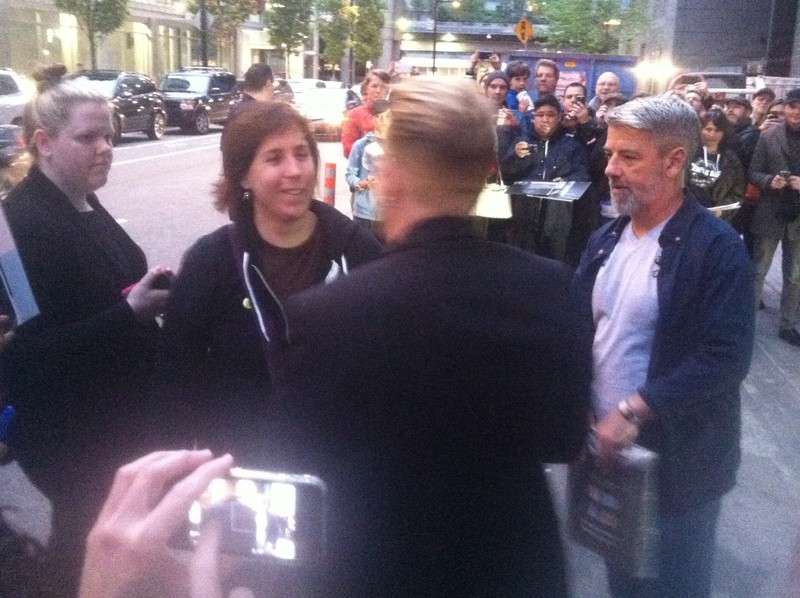 So last week, I went to Vancouver, British Columbia in the beautiful Pacific Northwest Coast of Canada to see the first two shows on U2’s Innocence + Experience Tour which were on Thursday May 14th and Friday May 15th. I took a week off, arriving on Monday, because I had the additional hope/dream/goal of meeting the band or getting invited into a rehearsal, neither of which is a far stretch as the band has been known to greet fans and invite them into rehearsals from time to time. I wasn’t counting on either of these things happening, mind you; I’m a realist. But I felt like there was nothing wrong at all with giving it a shot. Why not? Life is too short for regrets. I’ve learned that well. Over the last few days, I’ve struggled with blogging about this because I don’t want to come off as a braggart. A lot of U2 fans can be like that. It’s the first thing they will say about themselves in an introduction. In my fandom, I’ve met some people who have deluded themselves into thinking they have some sort of connection with a band member because of their encounters. I don’t want people to associate me with those kind of fans. I’m just a girl who feels passionately about a band and the wonderful music its members create. I love Bono especially, but when I say that, I mean that I admire him for the humanitarian he is, his intelligence, the work he does in the world, and the beautiful lyrics he pens (sometimes with The Edge). Those words, along with the sonic experience of the music, have inspired me, lifted me up when I was low, and made the best moments of my life feel even grander. U2’s music has been a part of my DNA since I was 15 or so, when Achtung Baby came out, and it has never left me. I guess a part of me just really wanted to let the band know that. And that is why I wanted to try to meet them (especially Bono). I suffer no delusions that to any band member, I’m anything more than a stranger. 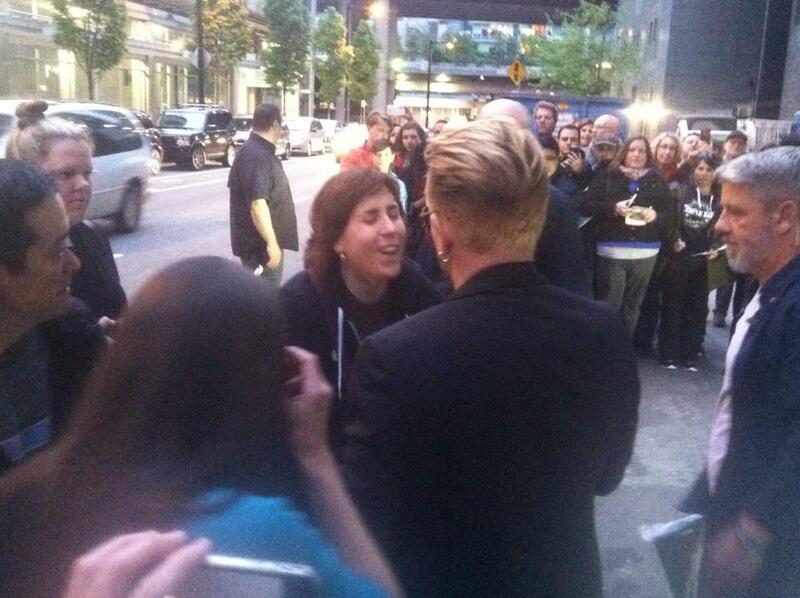 Which is what makes my encounter with Bono so much more awesome. Anyway, I’m telling the story because some of my friends have asked me to. If you feel I’m bragging, you can just stop reading now. The entire goal of my meeting any of the band was just to express my appreciation. I had nothing for a band member to sign. I don’t know why; I just don’t have anything in my possession at the moment that feels special enough to have signed. I didn’t want to lug vinyl around for days. In 2011, the last time I made an effort to meet U2, I carried around an envelope that contained a print-out of the sermon I gave as a layman at my church (Unitarian Universalist) called “Spiritual Journeys Through The Music of U2.” I wanted to give it to Bono because I was proud of it and it was the best, rational explanation my love for U2’s music. Part of me wanted Bono to see that from his creations have sprung inspired writing. I wanted him to know that I get what they are doing. I still have that envelope, and it’s still sealed, but since 2011, I’ve felt rather silly about it. Why would he read it? It seemed kind of like I was pushing something on him and I really didn’t want it to go that way. A lot of fans also try to push stuff on the band–some documentary they are trying to complete or some written work about being a fan. I just didn’t want to use that meeting as self-promotion. I didn’t want the band to think I wanted anything from them. Because all I want is for them to create more music. 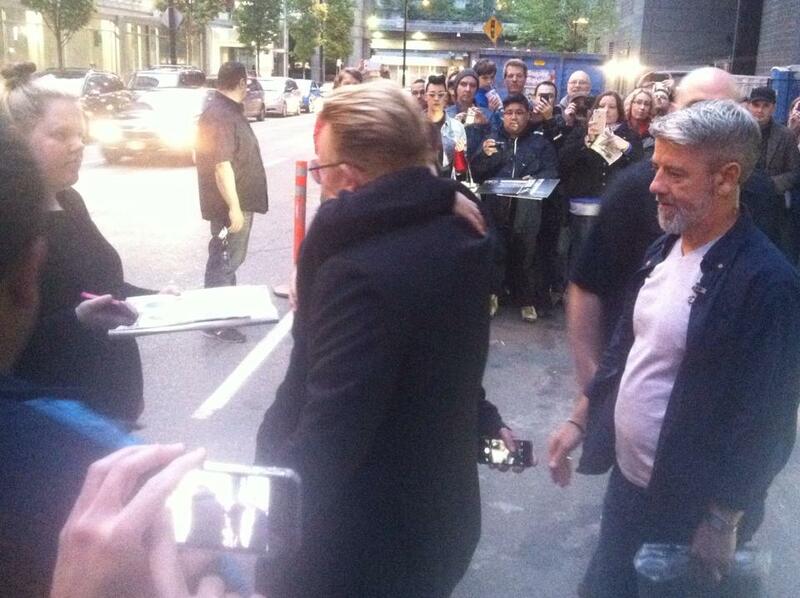 So I went to Vancouver with nothing in hand for the band to sign and no agenda. I just had a rough idea of what I wanted to say if given the opportunity. I went into every attempt assuming that I would strike out (I’m a pessimist) but that it would be great if I happened to meet the band. As soon as my friends, Kristy and Shawn, and I arrived in Vancouver on Monday, we began to check out the scene around the arena. We scoped out possible entry points for the band and found a spot around a side of the area that was low traffic and mostly used by pedestrians. It seemed like the best spot because there was a lot of activity with recognizable U2 techs hanging around the entrance smoking. Some other fans were hanging around there so we hung around too. 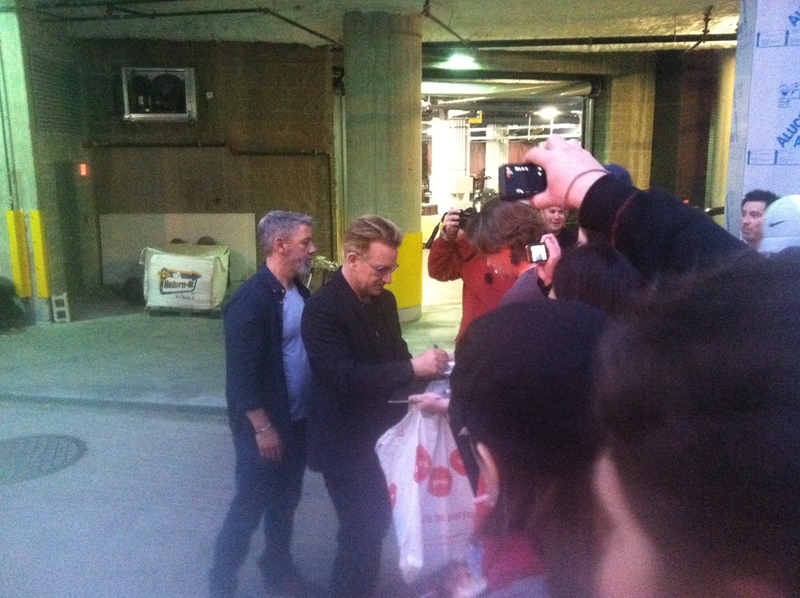 Someone claimed to have seen Bono go into the arena earlier for rehearsals. It was kind of a crazy evening as groups of fans waited there and another garage opening on the next side of the arena that faced a busy street. I guess occasionally the garage door would open on that side and fans would run over there and we followed those false alarms several times. I’m not going to admit how long we stood out there that night… But we left at 1am… And apparently The Edge came out to greet fans shortly thereafter. Oaf. Tuesday was more of the same. We waited around the arena for a very long time. The hope at first was that we would get invited into the iHeartRadio full dress rehearsal that had been also a prize for some contest winners. 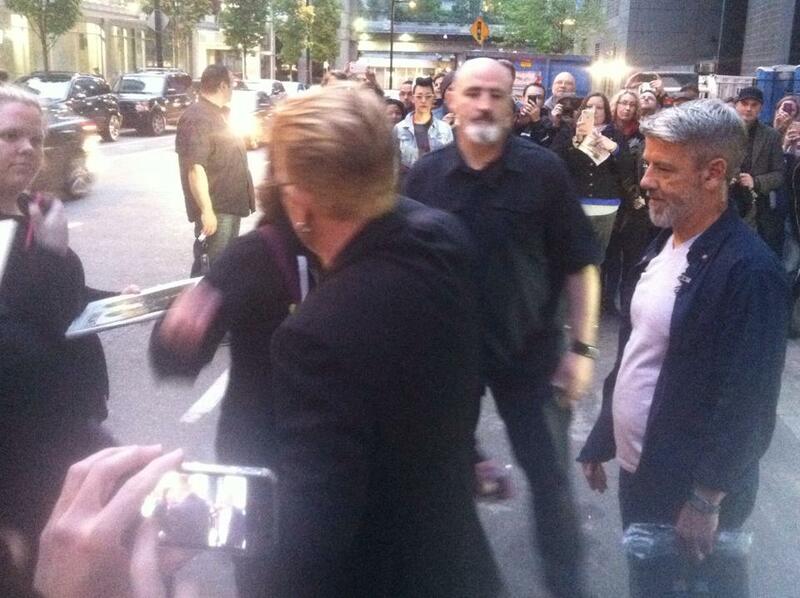 Brian Murphy, Bono’s bodyguard, had come out earlier in the day and neither confirmed or denied this as a possibility. By 9pm, we figured we’d lost out on that opportunity. There was some activity of people exiting at one point, but rehearsals continued for several hours. We heard through some of the fan websites that the band had run through two full rehearsals. We couldn’t hear a thing because the traffic around Rogers arena was so incredibly noisy. So we chaotically formed a line on the sidewalk. People were bunching up so Shawn, Kristy, and I took the initiative to spread out away from the car. 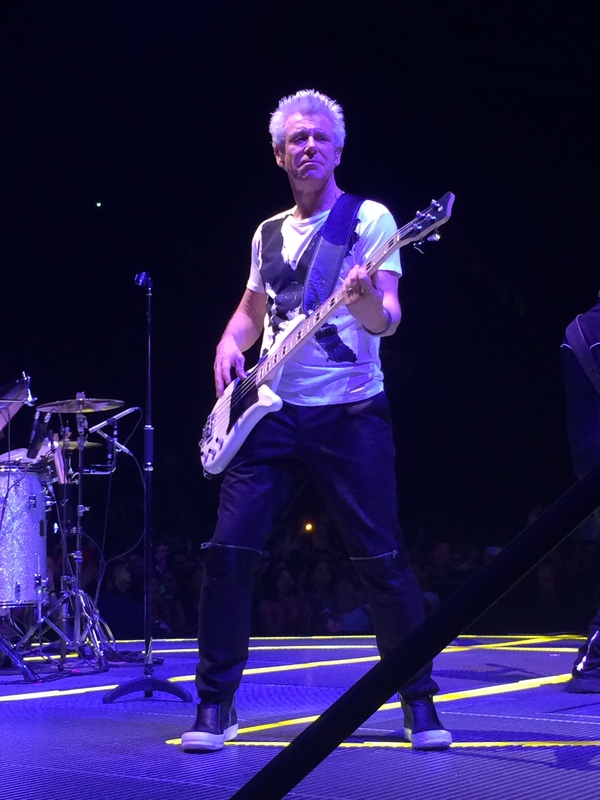 The security guy opened the door to the sedan and Adam Clayton, U2’s bassist, stepped out. He immediately walked to our end of the line which, unfortunately left us a bit unprepared on how to handle the situation. Adam, Mr. Literal, replied, “Sure, just take them as I go.” He moved to the next people in line who had items for him to autograph. That baffled us because we thought the band were going to be flying to Ireland. Through the many news sources, we learned that drummer Larry Mullen Jr.’s father had died on Sunday and was currently in Ireland for the funeral that would take place the next day. But, we later learned, the other members of U2 would remain in town the following day. A few minutes later, a black SUV rolled slowly out of the garage. Through an open window in the back, Bono waved at the crowd. I noticed he was wearing some kind of hat. It was nice that his vehicle didn’t peel out of there quickly, which he could have easily done. 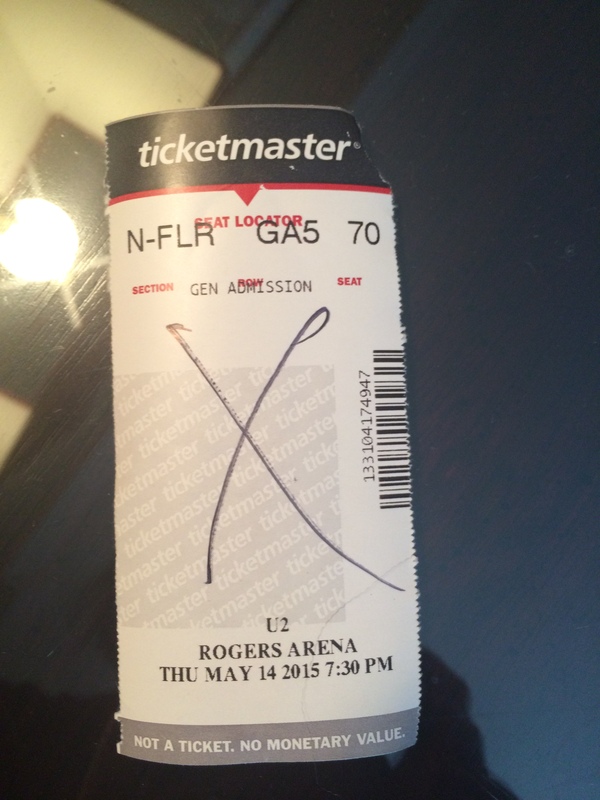 Obviously Bono still wanted to acknowledge his fans. “You’ll come out tomorrow?” someone shouted. Bono nodded. People applauded and the SUV continued down the street and out of sight. It was still thrilling to see Bono drive by like that. I left feeling as though that might be as close to meeting the band as I ever got. So we took it easy, hanging around town. We had planned to go do something touristy in Vancouver, but never really got our stuff together enough to go anywhere. We, who aren’t used to the rock star schedule, slept in the next morning. We took a trip in the late afternoon to an ice cream shop and on our way back to our hotel, we passed the door from which the band had exited the night before. Several people were brazenly milling about next to the driveway and garage door. We looked at each other in confusion and went to join them. No one seemed to have any direct information about what was going on. It was about 7:30pm and a lot of diehard fans were at a party hosted by one of the big fan websites. We did not see some of the usual people waiting. About 10 minutes later, Brian Murphy appeared, coming around the building from the side of the arena–the side on which we’d spent several hours waiting on Monday night. 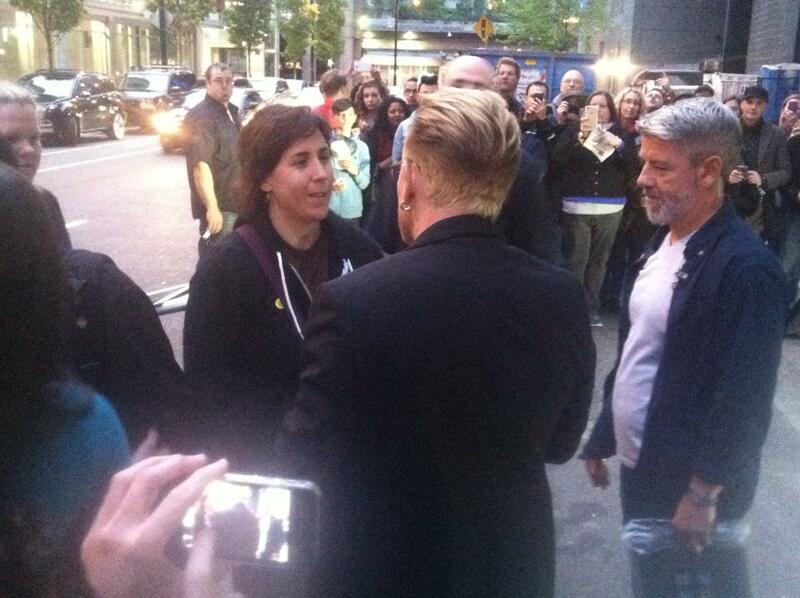 He said that Bono might come out soon and he asked us to line up single file on each side of the driveway to wait. Once again, there was some chaos as fans shuffled to find a position. We took the lead to go start the line on the other side of the driveway. Others followed us. Brian looked wearily at the group. He then nodded and started back in the direction from which he’d come. I was at the end of the line on the right side of the driveway and before he disappeared behind me, Brian put his hand on my shoulder. “Be careful,” he said to me. Everyone was tense. We stared at the garage door. I took deep breaths, my stomach turned. Was this really going to happen? 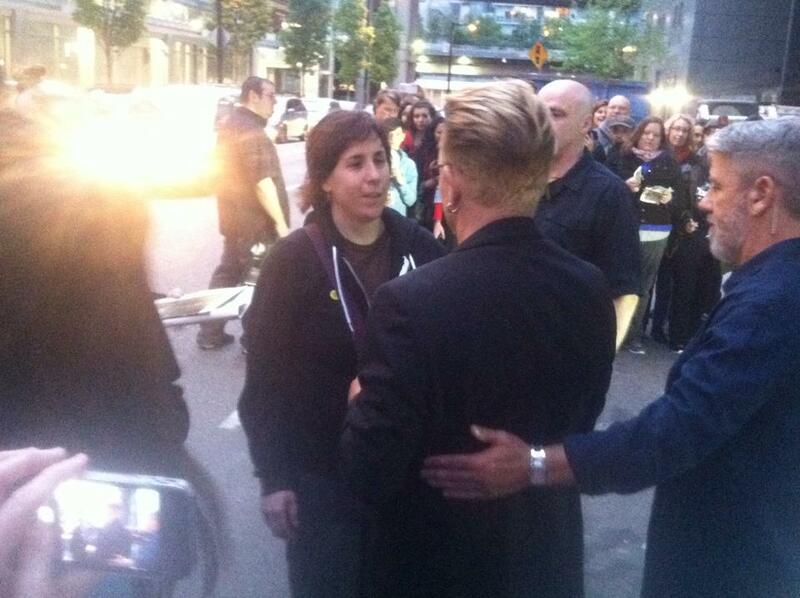 Was I actually about to meet Bono? It seemed unreal. As we waited, more people began to appear. We were starting to get nervous because if too many people showed up, it would ruin our chances of getting to meet Bono. The group was pretty small at the moment, but the more time ticked by, the more people would find out who we were waiting for, especially given the fact that word spreads like wildfire on social media. I think we waited about 40 minutes or so. Time continued to tick by slowly. My friend Margaret appeared with her mother and I told her excitedly to get in line and filled her in. Then two friends of hers arrived. People were starting to spill into the street. Crap. I kept repeating Brian’s words of warning about the street so people started to line up behind me. I couldn’t believe how oblivious some people were behaving with the speeding traffic so close. Suddenly the garage door began to rise, inch-by-inch revealing Bono from the feet up. He looked incredibly handsome, dressed in a black shirt with a dark suit top and black pants. He wore a pair of aviator glasses with purple tinted lenses. Just as quickly as turning on a light, the front man surveyed the crowd and beamed. All theatrics, he made swimming motions with his arms. Then he walked to the first people on my side of the driveway and began working the crowd. As he signed autographs, he talked to each person personally. He answered questions in an easy manner, laughing and responding cleverly. Brian told us that Bono did not have time to take pictures with each of us personally, foiling our plans to each get a picture with him. In my head, I practiced what I wanted to say to him. I pictured shaking his hand and saying the simple words. That was all I needed to do. I repeated it in my head over and over as he moved down the line. 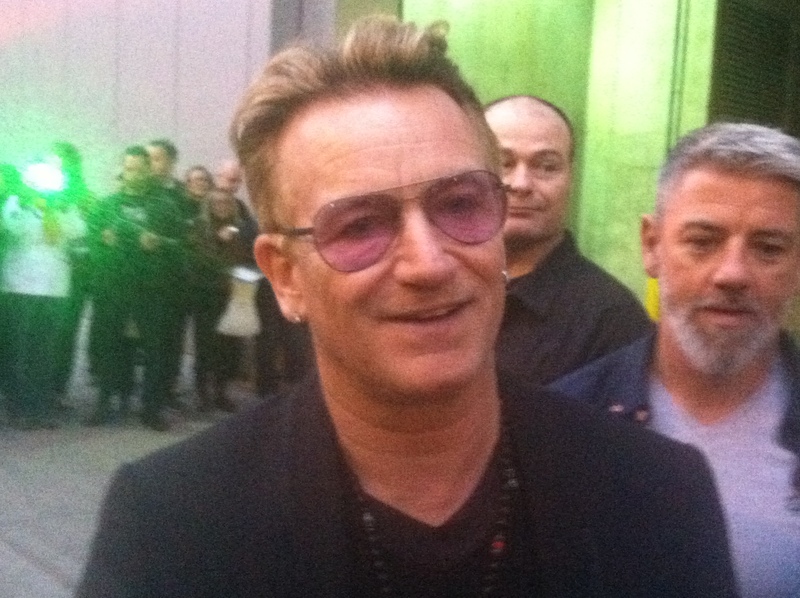 Bono close up. Perhaps acknowledging Kristy’s iPhone case. He signed her phone and they may have exchanged a few words. It was my turn, but before I could say anything, my friend Margaret got his attention and he moved on to her. Damn, I got passed by! I was fine with my friend having a moment with our hero, but I was about to miss my chance. This is not going to go down like Adam, I thought quickly. You need to stand up for yourself and say something! I looked at Brian Murphy who stood to Bono’s side in front of me. “Okay, step around to the end of the line,” he said. He looked at the iPhone set to camera mode in my hand. “No pictures!” he reminded me. “I know, I just want to tell him something,” I said as I moved behind the last five people to the end of the line. The other security guy looked over at me, (rightfully) ready to stop me from getting what appeared to him as an attempt to get more attention from Bono. “Brian told me to go to the end of the line,” I said. 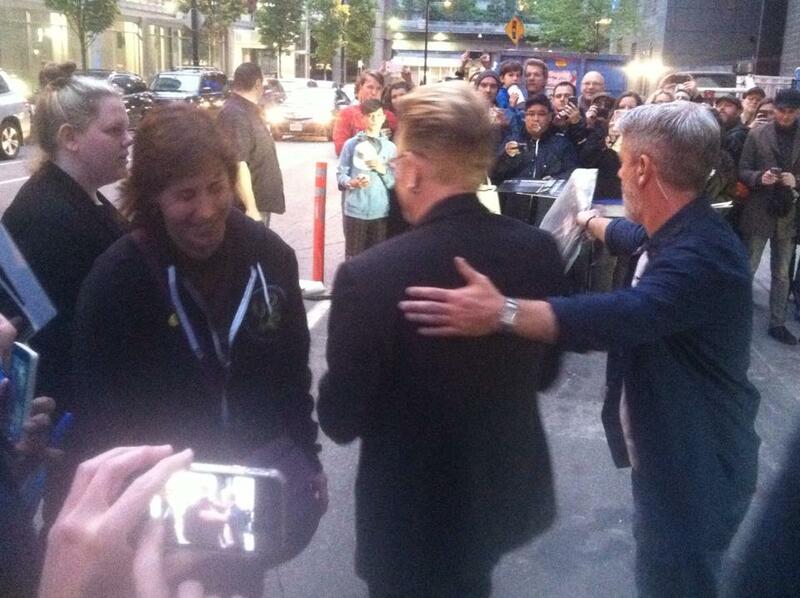 The security guy got Brian’s attention and Brian told him that it was okay. The unnamed security guy moved aside to let me come forward. 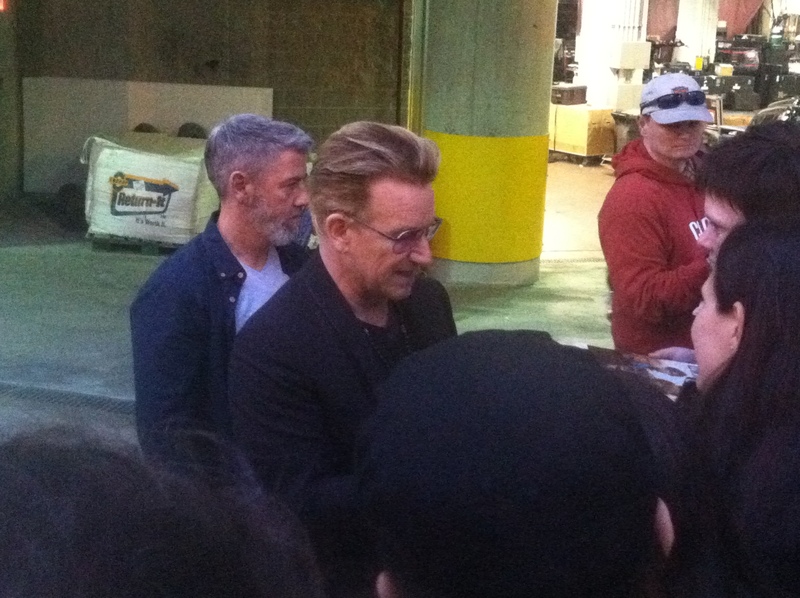 Bono was still talking to the people next to me. A girl was telling him she was a doctor working on AIDS research. I couldn’t believe how humble he was. Here he was, the biggest rock star on the planet, someone everyone in this group admired, and he was telling this girl how much he admired her. I was stunned. 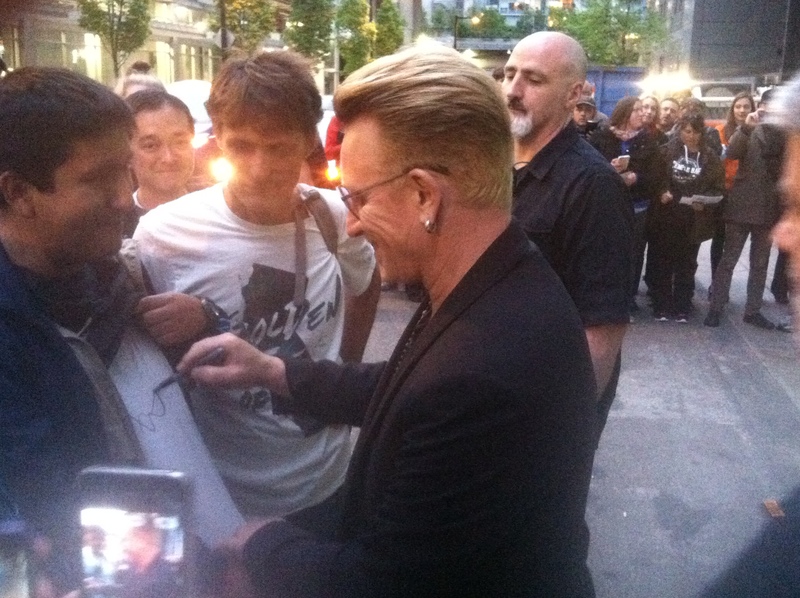 Bono signs a fan’s shirt. The fan borrowed a marker from Shawn. And then the next thing I knew, he was standing right before me, looking right at me with those intense blue eyes behind purple lenses. All thoughts left my head. I had his full attention and for the life of me, my mind was completely blank. “I forgot what I wanted to say,” I said out loud. Oh my god, I have this moment and now I’m going to blow it! my mind screamed. Think, Heidi, think!! Think! Seconds passed away in silence. I knew I didn’t have much time to get it out. I swallowed. Then it came to me. I always thought I’d tell him about Mike specifically, how the song “Walk On” had become my anthem for recovery all those years ago. But since realizing early on in the week that if I’d get any moment with any band member, it would be short, I made a quicker, less specific version of the speech in my head. 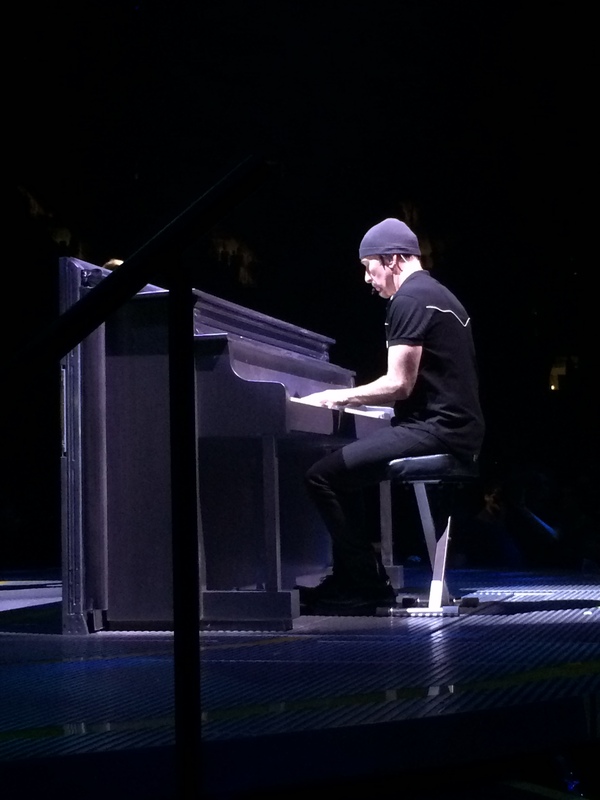 I just wanted U2–especially Bono–to know that their music made a difference to individuals like me. I think if I’d ever written anything that inspired or helped someone, I’d want to know that I affected them in some way. To me, it was like speaking artist to artist, even if Bono had no idea that I too am an artist; or, at least, I aspire to be. And then he reached his arm back inviting me into a hug. I immediately slid into his arm and hugged him back. In my mind, I’d always imagined he’d hug me after I’d told him some version of my practiced speech, so it was truly a dream come true. The scent of some wonderful cologne filled my nose. (Girls always ask how he smells and I can testify that he smells wonderful.) 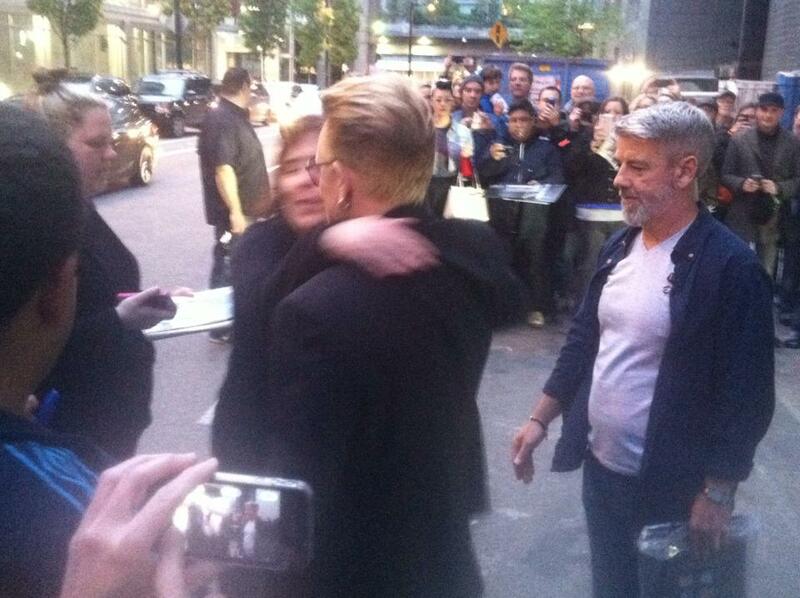 I was vaguely aware that I was hugging Bono. Wow. We both pulled away naturally and he moved on. Words cannot even describe the elation I felt at that moment. Ever since meeting him and watching him interact with his fans (not just me), I can only come up with one way to describe him: “amazing grace.” He is honestly not like any other celebrity I’ve ever met. He has an aura around him that exudes a calm patience. He cares about giving each of his fans a special moment and he listens. He is the complete opposite of the egomaniac that his haters like to paint him as. They say that meeting your idol can really ruin your love of his work. He might not live up to the expectations you have of him, or he might say something that makes you realize he’s not the man you imagined him to be from his work. But this is not the case with Bono. If it is at all possible, I feel like I love U2 more because of this experience. 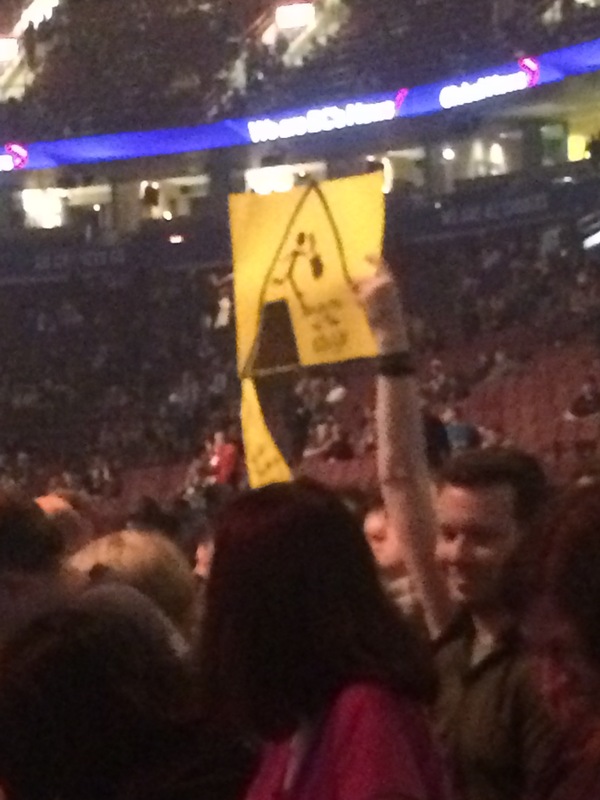 It should also be mentioned here that U2’s security is just as accommodating as the band appears to be. They want you to meet the band too. I can think of dozens of rock stars who totally blow off their fans and their security treats fans with a disconnected callousness as though they are the enemy. But U2 surrounds themselves with good people too. The fact that Brian didn’t just shrug and say, “Oh well,” when I told him that Bono had passed me up just speaks volumes.